Trees to 61m; trunk to 2.5m diam., usually straight; crown conic to rounded. Bark yellow-brown to cinnamon, deeply furrowed and cross-checked, forming large irregular scaly plates. Branches spreading-ascending; twigs stout (to 2cm thick), purple-brown, often glaucous, aging rough. Buds ovoid, tan to pale red-brown, 2--3cm, not resinous; scale margins conspicuously fringed. Leaves 3 per fascicle, spreading-ascending, persisting (2--)4--6(--7) years, 12--22(--25)cm ´ ca. 1.5--2mm, slightly twisted, gray- to yellow-green, all surfaces with fine stomatal lines, margins finely serrulate, apex acute to acuminate; sheath (1--)1.5--2.5(--3)cm, base persistent. Pollen cones lance-cylindric, 20--35mm, yellow to yellow- or purple-brown or yellow. Seed cones maturing in 2 years, shedding seeds and falling soon thereafter, nearly terminal, spreading, slightly asymmetric at base, ovoid-conic before opening, cylindro-ovoid when open, (10--)15--30cm, light red-brown, nearly sessile or on stalks to 0.5cm, abaxial surface of scales not darker than or sharply contrasting in color with adaxial surface, scales in low spirals (as compared to Pinus ponderosa ) of 8 or more per row as viewed from side, those of cones just prior to and after cone fall not so spreading and deflexed, thus not so much separated from adjacent scales; apophyses slightly thickened and raised, not keeled; umbo central, slightly raised, with short, slender, reflexed prickle. Seeds ellipsoid-obovoid; body ca. 1cm, brown or gray-brown, mottled darker; wing to 2.5cm. 2 n =24. High, dry montane forests mostly above the Pinus ponderosa zone; 2000--2500m; Calif., Nev., Oreg. ; Mexico in Baja California. Pinus jeffreyi has a form very similar to that of P . ponderosa , but it is a smaller species when compared with sympatric populations of the latter. 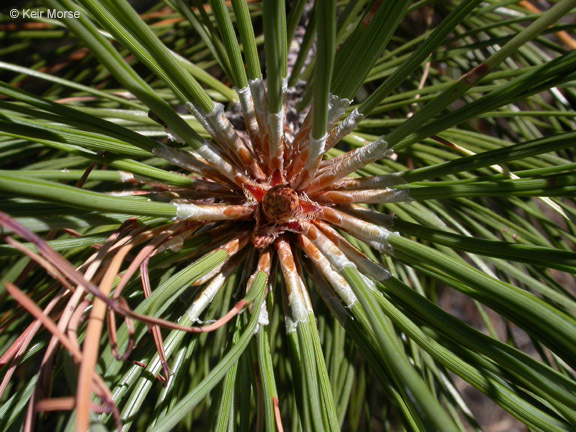 It is cut and sold under the same name as P . ponderosa , but the sweetish odor of the fresh-cut wood contrasts sharply with the turpentine odor of ponderosa pine. The resin chemistry of the two species is significantly different.